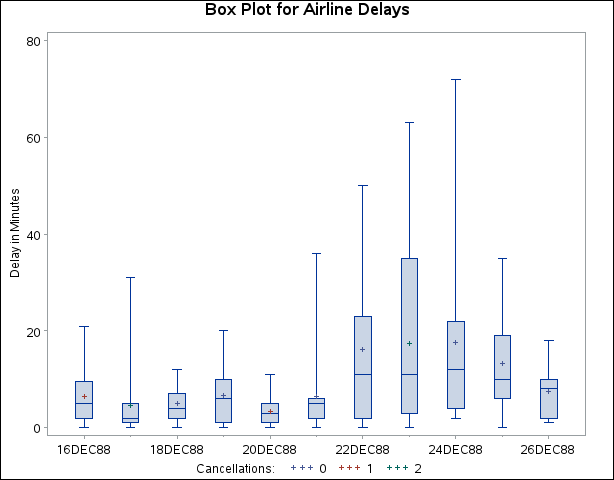 In this example a box plot is used to compare the delay times of airline flights during the Christmas holidays with the delay times prior to the holiday period. The following statements create a data set named Times with the delay times in minutes for 25 flights each day. When a flight is canceled, the delay is recorded as a missing value. 17DEC88   1  10   3   3   0   1   5   0   .   . In the following statements, the MEANS procedure is used to count the number of canceled flights for each day. This information is then added to the data set Times. The level of the symbol variable ncancel determines the symbol marker for each group mean, and the SYMBOLLEGEND= option controls the appearance of the legend for the symbols. The NOHLABEL option suppresses the horizontal axis label. The resulting box plot is shown in Output 28.2.1. The delay distributions from December 22 through December 25 are drastically different from the delay distributions during the pre-holiday period. Both the mean delay and the variability of the delays are much greater during the holiday period.